Chirotables.com has the best in Intersegmental (IST) and Roller Tables. Call us today (1-800-553-0057) for more information, options and to order your intersegmental (IST) or roller chiropractic table! Brands include: Ashworth, Lloyd, Williams, Zenith, Thomas and MT Tables. The ASUL-200 features three custom-contoured molded rollers that will deliver consistent and comfortable pressure. The pressure of the rollers is controllable with the 16" transverse roller paths treating an 8"x19" area. Best-selling intersegmental (IST) table / roller table! 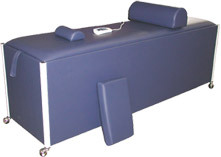 Controllable 16” transverse roller path treating an 8” x 19” area, Stationary treatment tat covers 5”- 7”, Powder coated metal cabinet, 30 minute timer, Head pillow and leg bolster. Clockwise & Counter-clockwise Roller Action, Raise/Lower Rollers up to 4" by 1/10", Roller Travel up to 24", 0-30 Minute Timer, Automatic Roller Process, Vibration, Digital Electronics, Hand Control Pad and much more! Doctor's favorite intersegmental (IST) table / roller table! 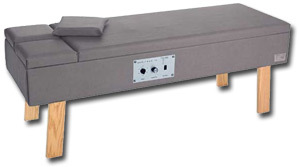 The ASH-7000 SPINALIGN is a full-featured intersegmental massage unit providing maximum therapy flexibility. Simplicity of mechanical design and rugged construction can provide long service in the professional setting. Three-motor operating system, Tri-axial roller, Full adjustment of roller pressure, Massage of single area or full back, Clockwise or counter-clockwise roller rotation, Manual timer controlled, Upholstered in durable Naugahyde© in a range of colors, Head pillow and leg bolster are standard. The Heritage #10 Intermittent Segmental Traction Table with new and improved features makes it one of the best-selling tables on the market today. Special sales price on this intersegmental (IST) table! The table has a built in foam pad, which replaces the old-fashioned loose table top pad that slips and slides around on the patients. Your patients will relax and feel more comfortable on our extra wide 24-inch table. The table features 8 rollers with variable speed vibration down a 24-inch track to deliver a gentle relaxing massage with a Spring Loaded Carriage that contours the spine. To make life easier, the adjustable timer can be set up 30 minutes. This versatile table is also perfect for exams and therapy! 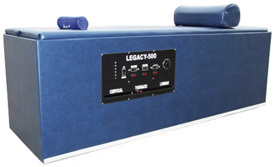 With unmatched quality and workmanship, the Legacy–500 is vastly becoming the industry leader. This table is specially designed to accommodate all body types and sizes. With two more inches of spinal travel than most, and three massive eight-inch wide massage rollers (the largest in the industry), this Intersegmental Traction Table (IST) will exceed all expectations. 30-minute timer, Reversible massage direction, Adjustable massage pressure, Vibration with On-Off feature, Automatic massage pressure lowering, Insolate specific area or full spinal massage and Cervical gel roll and knee bolster. Description: Intersegmental (IST) tables, roller tables, Ashworth Spine-U-Line (Model ASUL-200), Thomas Heritage 10, Williams/Zenith ASH-7000, KyroFlex Standard Roller Top Table, MT Tables Legacy 500, MT Tables Legacy 501 and Lloyd Cosmic III. All prices on Chirotables.com for all intersegmental tables (IST) and roller tables are subject to change without notice. Please call us for up-to-the-minute chiropractic product availability.